Rachel J Homes is delighted to market this Well Presented Detached House ideally situated in the popular location of Sand Bay. If you are looking for a home on the coast with great sized versatile accommodation then make sure this is on your list to view. The accommodation briefly comprises of Entrance Hall, Lounge, Study/Dining Room, Kitchen/Diner, Five Bedrooms, Downstairs WC, En-Suite to Master, Front and Rear Gardens, Garage and Driveway with parking for several vehicles, Added benefits of this lovely home include Double Glazing and Gas Central Heating. Accompanied viewings - CALL NOW!! UPVC Double glazed window to front and to side, range of wall and base units with work surface over and tiled splash back, 5 burner gas hob with extractor over, eye level oven and grill, one and half bowl stainless steel sink and drainer with mixer tap over, space for washing machine, fridge and dish washer, cupboard housing Vaillant boiler, radiator. UPVC Double glazed window and patio doors to rear, radiator, electric feature fire set into marble surround, tv point, telephone point. Low level W/C, radiator, pedestal wash hand basin. Velux window, storage cupboard housing hot water tank, loft hatch, doors off. Velux window, radiator, low level W/C, panel bath with hot water shower over, pedestal wash hand basin. UPVC Double glazed window to rear, radiator, storage cupboard with rails. UPVC Double glazed window to rear, radiator, eaves storage, tv point. 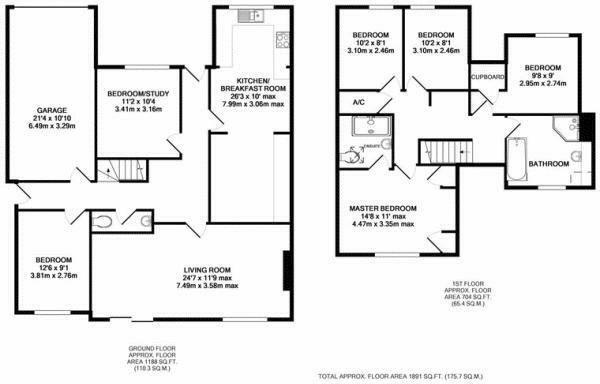 UPVC Double glazed window to front, shower cubicle with hot water shower, wash hand basin set into vanity unit, panel bath, low level W/C set into vanity unit, part tiled walls, radiator. South facing, enclosed by fence, laid mainly to lawn with large patio area, outside tap, paved access to front. Enclosed by hedge, laid to tarmac with parking for several vehicles.